The Rose Bowl, the Granddaddy of Them All, the most prestigious event in college athletics, a Pasadena staple. 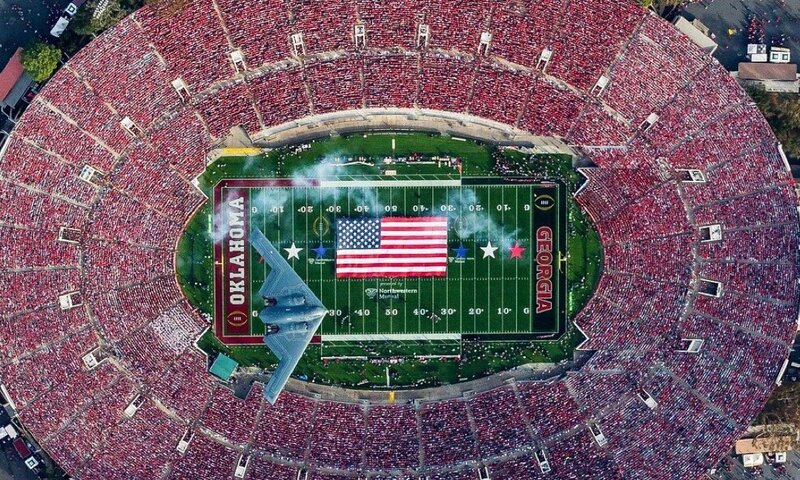 The 104th Rose Bowl game, a college football semifinal matchup between the University of Georgia Bulldogs and the University of Oklahoma Sooners, was unlike any before it, yet it was the same in many other ways. It was the first Rose Bowl game to ever go to overtime. It was the first matchup ever between Oklahoma and Georgia, despite each school fielding a team for over 120 years. It was the first Rose Bowl appearance for Oklahoma in 15 years, and the first for Georgia in 75. The game was different. There was no Pac 12 team, there was no Big 10 team. Still, so much was the same, and so much was familiar. The setting was perfect, as every blade of grass was perfectly in place, and every glance at the mountains brought a sense of calm. And the football was brilliant. It was a clash of styles. Early on, Oklahoma’s wide open offense, led by Heisman trophy winner Baker Mayfield, stole the show. Rodney Anderson was a battering ram at Running Back, while Mayfield and Marquise “Hollywood” Brown took to the air. Though the Sooners seemed to be firmly in control as the half neared, a poorly executed squib kick led to three points for the Bulldogs before half, as Rodrigo Blankenship hit a 55 yard field goal to bring the score to 31-17 at the break. The action was just getting started. If the 1st half belonged to the Sooners, the 3rd quarter unquestionably belonged to the Bulldogs. Georgia’s defense stiffened, and Nick Chubb and Sony Michel pounded away on the ground. Quarterback Jake Fromm hit timely passes, and seemingly in the blink of an eye, everything changed. Oklahoma’s 17 point lead was gone, and heading to the 4th, the score was tied at 31. One minute in to the 4th quarter, Georgia took the lead for the first time, but the Heisman trophy winning Quarterback and his Sooners would respond. With 8:47 to play, Oklahoma tied the score on an 11 yard pass from Mayfield to Dimitri Flowers. Less than two minutes later, momentum shifted once again. With Georgia driving, star Running Back Sony Michel fumbled, and Steven Parker scooped the loose ball and returned it for a touchdown. Six minutes later, Nick Chubb scored himself, and the game would go to overtime. In the first OT period, both kickers knocked in short field goals, and the game went to a second OT. Oklahoma had the ball first, but their Pasadena dreams soon turned into a nightmare. Austin Siebert’s short field goal attempt was blocked, and Sony Michel ran in a touchdown for Georgia minutes later. The game was over. The brilliant season for Oklahoma ended in heartbreak, and the magical season for Georgia continues. While things may have been different at the Rose Bowl on January 1, 2018 than ever before, one eternal truth remains- Pasadena is the capital of the college football world.